STRATEGIC PLANNING is the management process used to create a long-range plan for the future success of any entity. This page is designed to answer the fundamental questions about strategic planning. If there is a particular question not covered, please CONTACT US and we will happily answer your questions. Click on any topic to be taken to it. How do you begin a Strategic Planning process? What outcomes can I expect from Strategic Planning? 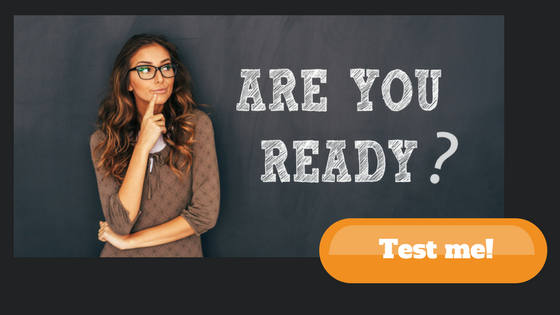 Take the Strategy Ready TEST. Find out if your team is ready to lead strategically. 10 quick questions can give your powerful insight. A strategic plan is a document that summarizes all the critical strategic thinking from the strategic planning process. It defines where the entity sees itself today and the challenges it is facing. It also describes the ultimate end-state it wants to create (its vision), the high-level path it plans to take to move from where it is today to its vision and finally the key near-term priorities to begin this journey. 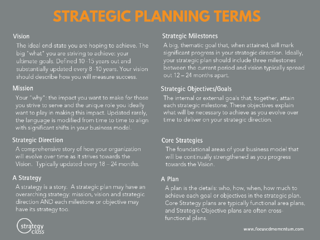 What is a Strategic Planning? 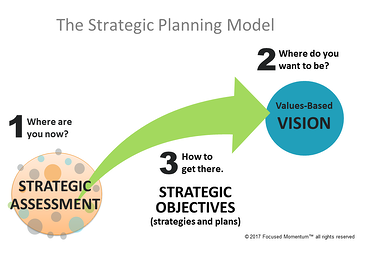 Strategic Planning is the management process used to create a long-range plan of how to achieve an ideal end-state or a set of goals often called a vision. This long-range plan is called a Strategic Plan. 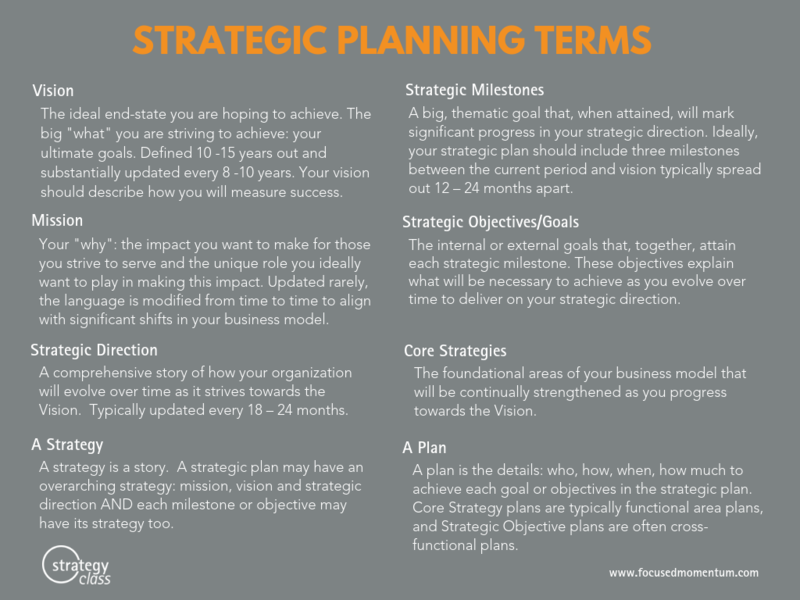 What is the difference between a strategic plan and a business plan? This question seems to always come up with discussing strategic plans. As already stated, a strategic plan is a document that defines a long-range plan. It typically covers a planning period of 10 -15 years and communicates the high-level plan to achieve a comprehensive set of goals by the end of this period. A business plan is a detailed planning document that defines, in specific terms, how to achieve a specific milestone or objective within the strategic planning period. The business plan covers specifics about product/program development, marketing tactics as well as revenue/growth targets and the plans to achieve these goals. A strategic plan has directional numbers that tell a very high-level story of how the business model will evolve as the strategic plan is executed. A business plan has more specific and detailed financial projections that guide investments needs, resource allocations/reallocations, and annual budgeting. A business plan documents what needs to happen in the near-term to align the organization to the strategic plan goals. To summarize, the strategic plan lays out the high-level path for planned evolution where as the business plan lays out the specifics on how to proceed next along this path. Why you need a Strategic Plan? A strategic plan creates a unified understanding of where an entity is going, what it hopes to achieve and how it believes is the best way to achieve its goals. It is a powerful leadership tool to engage stakeholders and align resources needed to achieve its goals. When done really well, it creates the basis for the organizational mythology that unites stakeholders in a common quest. The real value in dedicating the time and effort in strategic planning is the thinking that is stimulated that will ultimately spill over into every management conversations, formal and informal. What are our priorities and why? How do we make decisions when there is a new opportunity or a change impacting the orignal plan? What will we invest in and protect as we grow? A strategic plan can also be created to resolve a specific set of questions facing an organization when making a high stakes decision. You are seeking a significant investment in your business. You are seeking large donations for your mission. You have multiple stakeholder groups that need to be aligned with a common plan. You have a board or a funding group that asks you for one. If you are in a new leadership position (head of a division, new president or CEO, new Board President) and there is no strategic plan or one that is outdated (5+ years old). Your market has experienced a dramatic change, and your old planning is no longer relevant. You are seeking growth through a partnership, merger or acquisition. Your team is working hard, but not in the same direction. Silos and departmental (or personal) agendas are driving results, without any collaboration on common goals. You are planning for a significant change in leadership, such as a founder or founder type leader is retiring. You have experienced a significant negative event such as a fraud, an unfavorable legal action, or a regulatory change that destabilizes your company. When is the best time of year to start strategic planning? For entrepreneurs or small business owners, the best time to start is now - today! For smaller businesses that have an annual planning cycle, we recommend starting in the 3rd quarter of the current fiscal year so that you can use your insights to set new goals for the next fiscal year. For larger corporations, the strategic planning process will take longer and you still want your thinking to impact plans as soon as possible. If you are part of a corporate group, start your assessment in the 2nd quarter of the current fiscal year. If you so do, you will have new thinking formulated in time to impact the following year’s operating plans. Once you have your strategic plan, keep it alive by reexamining your assumptions every three years and using the two interium years to identify, evaluate and integrate responses to emerging issues, so you stay vision driven AND market responsive. A complete strategic plan should be created every six to eight years or when there is a leadership change. Strategic Planning requires a different thinking mindset than the mindset required for managing. We call the thinking needed for strategy development Strategic Thinking. 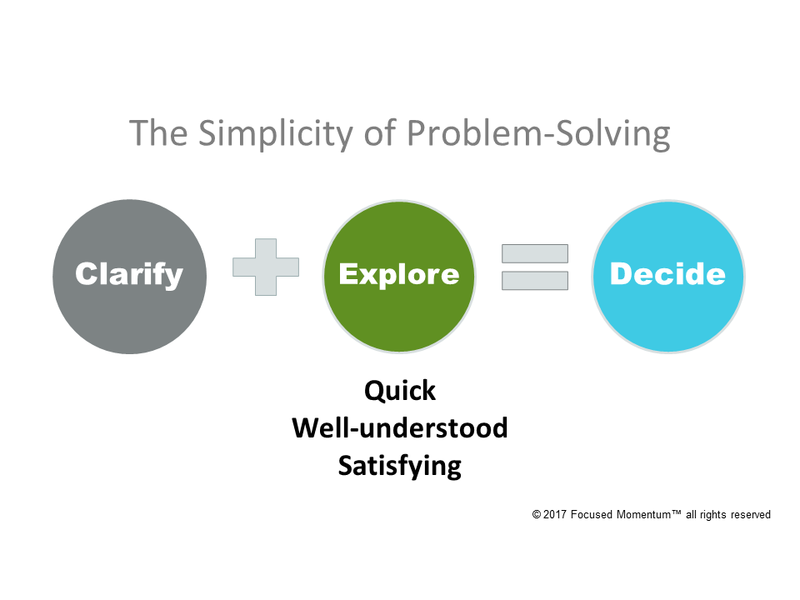 To facilitate this mindset shift, the strategic planning process is designed to disrupt the typical linear process often use in problem-solving. 1. Start with a comprehensive analysis of WHERE YOUR ARE NOW: Your Strategic Assessment. 2. Then, leave today behind and leap to the future (usually 10 – 15 years out) and define WHERE YOU WANT TO BE in that future period. This is your Vision and Future Business Model. 3. After defining the gap, you can begin to close it with HOW TO GET THERE: Your Strategic Direction or high-level Strategy MAP. By designing a non-linear (disrupted) process, you work to open up new thinking. This then mitigates against incremental planning that sets many organizations to fall behind their market. Your strategic planning project should result in greater clarity, confidence, and productivity. The strategic planning process should result in greater alignment and deeper common understanding of your priorities. At a minimum, the strategic planning project should produce the following. A summary of the status quo: your performance historically, your performance against your market and competitive set, the status of the key drivers of today’s business model. A summary of the beliefs about the future and the key strategic issues/questions to be addressed for future success. A clear vision of future success inclusive of your desired impact or mission statement. The core strategies that you will use to achieve your vision. Your strategic direction (path defined by milestones) you will execute to progress from today to the vision. Clear near-term next steps to begin implementation and to provide the ability to track the progress in the new direction. In addition to these products and outcomes, the value gained when teams hire a strategic planning expert is the ablity to participate rather than lead the process. A highly efficient, professionally designed and well executed strategic planning process that allows you and your team to fully participate in strategic thinking, ultimately producing a better strategic plan. More common is for an idea to come up in discussion with other ideas and then after exploration, the ideas will be ranked for their respective value to strategic direction. When an idea is highly ranked, it is developed from an idea into a strategy and then a plan. Other ideas maybe valuable, put for a later time. The process of taking an idea to an actionable plan is strategy development. Because it takes time to explore and develop thinking and time waits for no one, at times ideas deemed for later move ahead in the timeline or merge with other ideas. The strategic planning process embraces the fluid nature of strategy development in all shapes and forms. What makes leading a strategic planning process especially challenging is keeping track of, monitoring and leveraging all strategy development activities efficiently and effectively so that a new, truly brilliant strategic direction is created. Strategic planning can take just a few weeks for a small business, or many months for a large company with many product lines or markets. For example, at Focused Momentum®, our most in-depth customized strategic planning engagements are completed within nine months. However, we have seen large scale strategic planning projects that require engagement of many stakeholder groups take up to 18 months. This is one of those questions that only has one answer: it depends. Strategic planning is an investment and the costs can vary widely based on the size of the organization and the scope of the engagement with basic costs starting around $15,000 just to host a planning meeting. However, the best way to determine the costs for your organization is to request a no-obligation consultation with our staff at Focused Momentum. 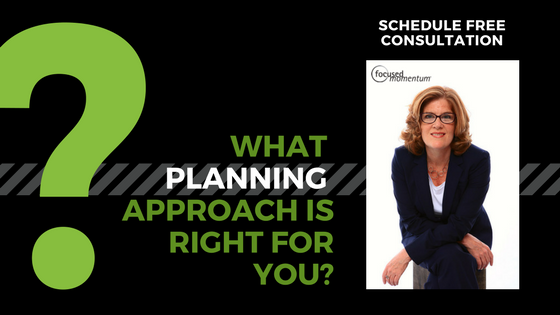 We have conducted hundreds of strategic planning sessions and we can not only give you quotes on costs but also offer valuable insights so that you can get more out of your planning efforts whether you decide to work with us or not. 1. Your Staff’s Time: This includes members of the executive planning committee dedicated to the effort rather than other management priorities. When you start your first comprehensive strategic planning effort, you need to give it the same senior management attention you would give to any other high priority project. The time commitment can range from a few hours a week to a full week depending on the stage in the planning process. We encourage a high-level of participation in our planning projects. Many times, executive teams try to conduct strategic planning efforts quickly and with just the involvement of those that have decision-making authority. The resulting strategic plans that are not very strategic. READ MORE on this topic: 3 Indications Your Strategic Plan is NOT Strategic. Alos, to make the most from your investment in strategic planning, we encourage the involvement of as many stakeholders as possible. This does not mean they need to participate in strategy sessions, but using surveys and interviews, you can engage all key stakeholder groups in your planning process. 2. Offsite Meeting Costs: Meeting offsite is important to the success of a strategic planning effort for two reasons. First, Strategic Planning needs a different mindset from day-to-day operations. Setting the meeting location away from the office where participants can effectively disengage in the day-to-day helps them make this shift in their thinking. Even more important is the confidential nature of the strategy discussions. Each member should feel they can discuss openly the issues facing the business without fear of setting off a rumor. The creative nature of strategy development means many topics are discussed, yet only during the final stage of the strategic planning process are decisions made. You want to be offsite to allow the flow of these exploratory conversations to happen free of the fear that they will be overheard by someone and misrepresented before you can finish your strategy development. For example, using the Focused Momentum approach, you will have only two large group meetings that will need an offsite location. The Strategy Creation Session, typically 3 days in length and the Strategy Integration Session, 2 – 3 days in length. 3. Travel Costs: This is specifically to bring participants to the meeting locations and for other travel required for research or strategy development. 4. Consulting Costs: The design of your strategic planning process will drive the consulting fees. In our experience, the higher end of the fee range is required when there are multiple business lines and thus greater complexity in strategy development. Your project may also run on the higher end if there are many stakeholders to engage requiring more time, or if there is a significant shift in your direction requiring more analysis and deep engagement to ensure a commitment to change. We often see meeting facilitators brought in to facilitate strategic planning sessions. That can work if you partner with them to provide the strategic thinking content. A facilitator is not a strategist, so don't set yourself (and them) up to fail if you need help guiding strategy development. Hire a strategic planning expert. At Focucsed Momentum. 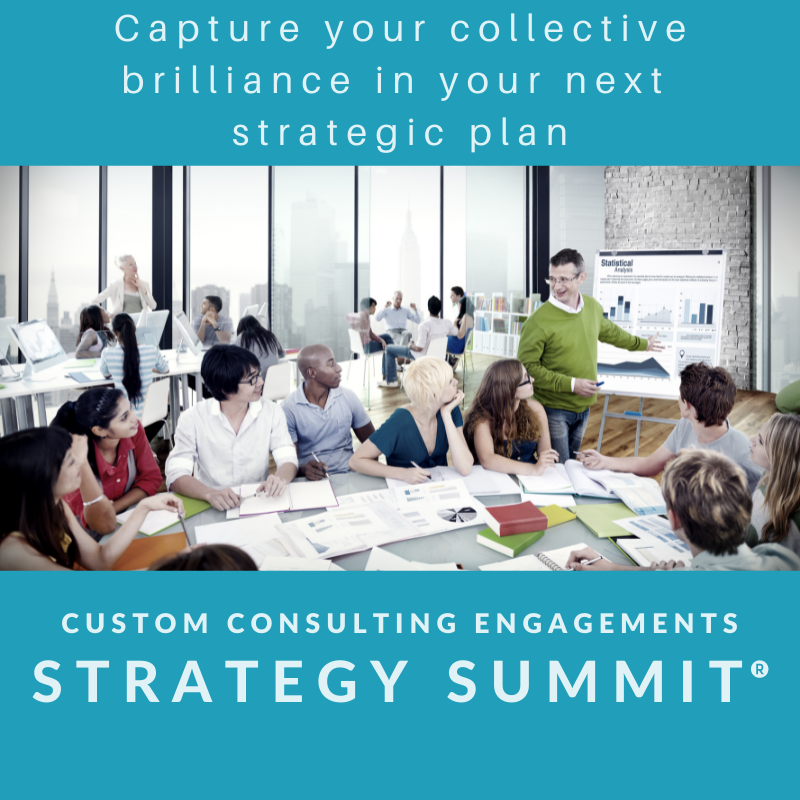 project fees for more traditional full scope, custom consulting engagements (our Strategy Summit®) vary widely, but project plans start at $85,000. 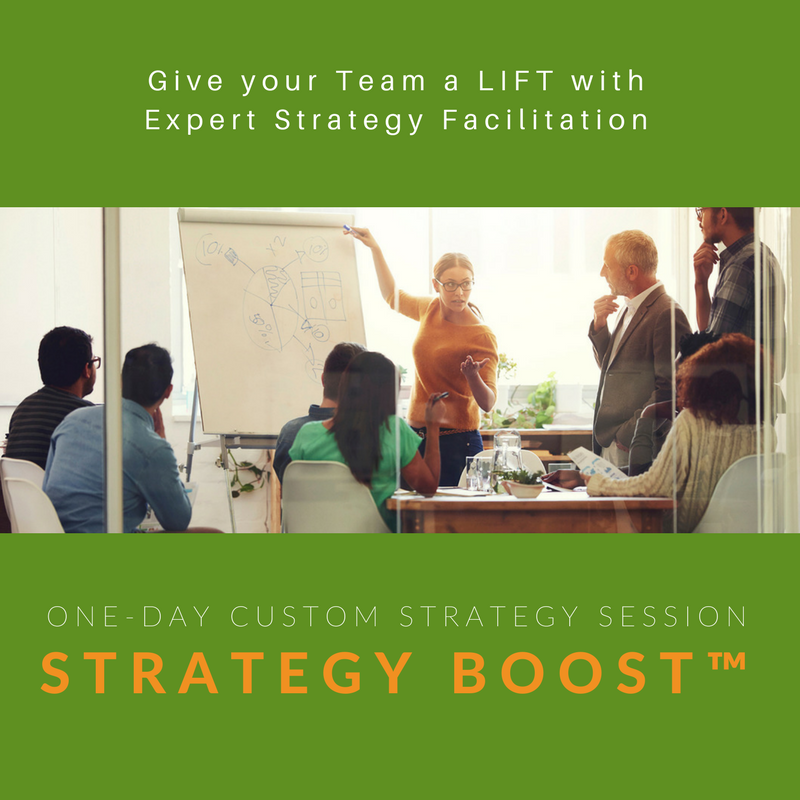 We have also developed a limited scope strategic planning workshop to provide smaller firms a lift in their strategic planning; a Strategy Boost™ starts at $15,000. Fees do not typically includes travel and materials cost. If your budget is tight, avoid surprises by discussing these reimbursable costs during project contracting. For a business: planning is the responsibility of the executive team typically with a presentation to their Board of Directors for approval. The sponsor for strategic planning is always the CEO; the executive team or senior leadership team drives much of the strategy development, but the CEO must be the driving force behind this effort. We highly recommend including as many brilliant minds available to you. 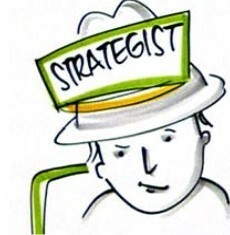 The process thrives on strategy discussions where everyone wears “the strategist hat”. You never can tell from where the spark of brilliance will come. We do recommend a subset of the stakeholder group act as process designers for large strategic planning projects; we call this group the Design Team. A Design Team has five or six people, the sponsor or CEO, and four or five others from the executive team or management roster. For a non-profit: strategic direction is best-developed hand in hand with the Board of Directors. In the nonprofit sector, sponsorship is shared by the senior staff person (CEO, President or Executive Director) and the President or Chair of the Board of Trustees. Participants in the process include all senior staff, all voting members of the Board of Trustees and other significant individual contributors on staff or at a volunteer level. Typically, donors not holding board seats are not involved in strategy development other than during the assessment phase. A Design Team of six to eight people is recommended for nonprofit clients also. The Design Team should be comprised of the CEO/President/ED, a few senior staff, and a few highly-involved board members – typically members of the governing or executive committee. A great strength of today’s organizations is the ability to solve very complex problems. However, every great strength can also be a weakness. If all your brilliant minds are focused on resolving today's issues, their focus could be too narrow to see future issues. Then soon enough they are right in front of you and you are struggling in response mode. Strategic planning will not completely solve competitive market pressures, but it can go a long way toward anticipating them. This is why group problem solving is NOT the method for strategic planning. Make sure you use the right approach to designing your planning meetings so you foster the best thinking for your future . Problem-solving follows a linear pathway. 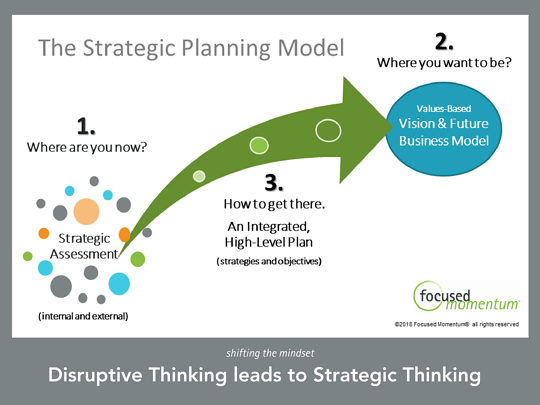 The strategic planning model forces a disruption in this linear path to create the space for new thinking. 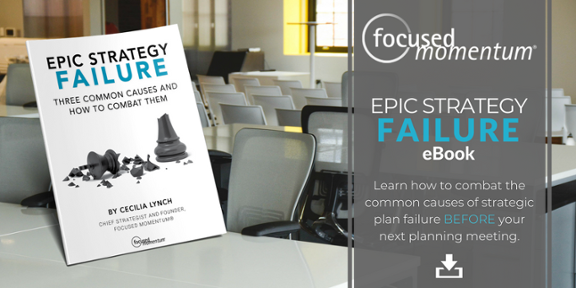 DOWNLOAD our latest eBook and learn how to combat strategy failure.